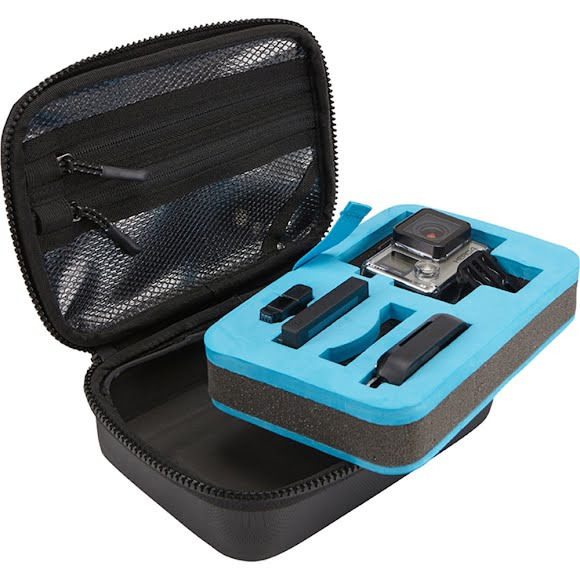 This durable Legend GoPro® Case from Thule utilizes smart organization for essential accessories to capture your next great adventure. A crushproof, padded compartment protects your investment when in transit or storage. A removable die-cut foam pad allows for easy, thorough cleaning. Sleek design enables you to easily fit your Thule Legend GoPro Case into another bag. This durable Legend GoPro® Case from Thule utilizes smart organization for essential accessories to capture your next great adventure. A crushproof, padded compartment protects your investment when in transit or storage. A removable die-cut foam pad allows for easy, thorough cleaning. Sleek design enables you to easily fit your Thule Legend GoPro Case into another bag. The integrated quick-grip handle can also be attached with carabiner to belt, harness, or pack. Now you are ready to document your adventures. Heat-molded, crush-proof SafeZone compartments safegaurd eyewear, personal electronics and other fragile gear.